The Steady Cross Earrings w/ Ruby Red gracefully capture light and faith with Yellow Gold scrolls, Rose Gold floral designs, and sparkling Ruby Red crystals. 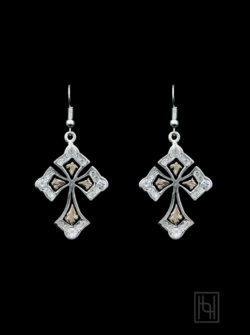 Pair this style with the Steady Cross Pendant to create a matching set. Sterling Silver & 1/10th Yellow Gold & Rose Gold with Ruby Red Cubic Zirconia and Black Antique.